Joseline meets up with Lovely Mimi. Mimi tells her about going out with Tommie. Joseline tells her “Watch your back with her. She has a bunch of mugshots.” Mimi laughs and decides not to mention her own past. Mimi tells Joseline about getting fired from Sierra’s shop and wanting to open her own shop. 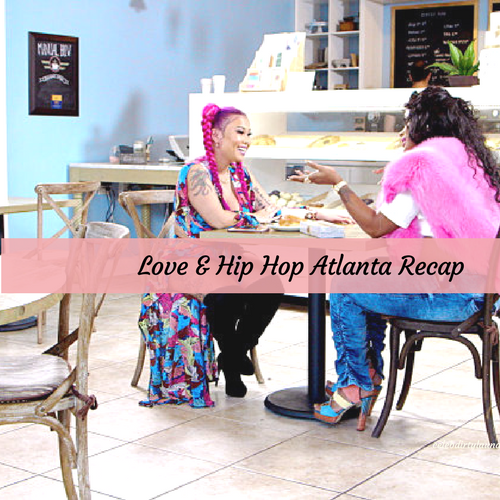 She says “I was hoping you could throw some clients my way.” Joseline tells her “I could pay you to do my nails, and then recommend you to some people, but I won’t give you any money.” Joseline then invites Mimi to come to her video shoot and participate. She tells her “You can do the girls nails and build your clientele.” Mimi agrees and seems very excited. Moriah is meeting up with Shooter on the low. She tells him “I don’t know what ya’ll have going on at home, but she’s not acting right at work.” It is then revealed that Shooter is sleeping with Moriah and giving her money on the side. Karlie and Joc meet up with Jasmine and Rod to discuss the rumors about Joc sleeping with Jasmine. Jasmine tells them “First and foremost I will deal with Kirk as I see fit. The paperwork has been filed and he will be served.” They then move on to deal with the rumor that Joc slept with Jasmine. Rod says “I hear you and your friends been spreading alot of rumors.” Jasmine asks him “Have you ever slept with me?” Joc says “I met a young lady named Jasmine. I did have a night with the young lady. I don’t know if you’re the same young lady.” Rod then throws a low blow and brings Joc’s baby’s mom into the conversation. The conversation deteriorates from there and Karlie and Jasmine are quickly at each other”s throats and have to be separated by security. I did have a night with the young lady. I don’t know if you’re the same young lady.” Rod then throws a low blow and brings Joc’s baby’s mom into the conversation. The conversation deteriorates from there and Karlie and Jasmine are quickly at each other’s throats and have to be separated by security. Tommie meets up with Treasure to try and clear the air about the other night at the club. The meeting quickly goes south when Treasure gets upset that Tommie called her low. Tommie tells her “You are low. You sleep with married men and have no class.” Treasure comes across the table and the two women quickly begin pulling hair and have to be separated by security.